I received this great board book from Barefoot Books via The Picnic Basket and I can already tell it is going to be a popular check-out. I read it to a preschool and kindergarten class today and they loved it. 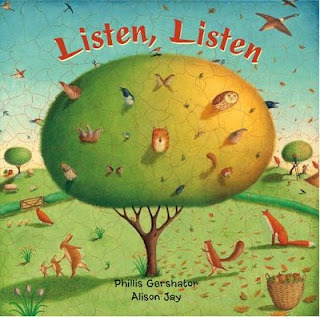 It is such an interesting example of the seasons turning with melodic language and fun sounds for young ones to make with you while you read. Both classes got the whole change of season theme, which was very impressive!